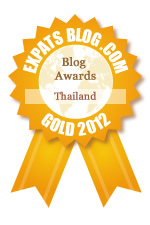 ExpatsBlog.com Expat Blog Awards 2012: Thailand Gold Award! This blog won the Gold Award for best expat blog in Thailand! Best site for Americans wanting to escape to Chiang Mai. very up to date with real articles about real situations. not like the pie in the sky **** found on most blogs. Agreed, this guy gives it to you straight. Lot's of fantastic information that can only be found by being there.